In layman’s terms it means being able to get to your money quickly and without a major loss. Liquid assets are things like checking accounts and money market funds. They can also include mutual funds and stocks in large companies that trade on a major stock exchange, although in times of severe financial stress even these may see major price swings. But there are lots of things people own that are not liquid. The typical family’s home is a large part of their wealth. Homes are not liquid; they can’t be sold quickly and converted to cash in times of need. What a home can be sold for is a guess; something that millions of people learned when the housing bubble burst in 2008. Families found that the value of their home was tens, even hundreds of thousands of dollars less than their mortgage. Besides a home, many stocks are not liquid. Shares in small companies with a few shares outstanding may not be liquid. Even the very wealthy are finding out that the liquidity trap can turn them from billionaires to paupers in short order. Forbes Magazine listed Elizabeth Holmes, the founder of Theranos, as America’s richest self-made woman last year with a fortune estimated at $4.5 billion. The most recent listing gave her net worth at zero. The reason for this is fairly simple. Her net worth was based on the value of one stock: Theranos. The stock was not publicly traded and if she had tried to sell some of it the share price would have plummeted because it would show a lack of confidence in the future of the company. So when Theranos ran into serious problems Holmes could not get out and her fortune literally disappeared into thin air. The average person can avoid the liquidity trap by following a few simple rules. Do not put too much of your personal wealth in things – like homes – that can’t be easily sold. Do not put too much of your personal wealth in one stock. You do not want your net worth to evaporate because of poor decisions by corporate management. Smart investors spread their financial assets widely. Realizing that they cannot accurately predict the future, they own stocks and bonds, domestic and foreign. If they don’t have the means to diversify using individual stocks and bonds they use mutual funds or ETFs. Get an advisor. Most smart people use professionals when they need medical, legal or financial advice. A private foundation has many advantages for the high net worth (HNW) individual. Along with the tax benefits, the foundation also provides a way of keeping families together. Private foundations sound like they are only appropriate for the ultra-rich; but that’s not the case. There are over 90,000 private foundations in the U.S. and 98% are under $50 million. In fact you can start a private foundation with as little as $250,000 according to Foundation Source. Of course the immediate advantage of a private foundation is the tax benefit you get from funding it. It sets you apart in the world of philanthropy and allows you to leave a legacy that can outlive you. It also provides protection from unsolicited requests for donations; you can always tell people that it’s a wonderful cause but you’ll have to check with your board. But one of the major benefits of a family foundation is that it can act in many ways like a family business. It can create the glue to keeps a dispersed family together working toward a common purpose. It creates a way of instilling family values and transmitting those to a younger generation. A large proportion of family foundations have two or more generations on the board. Most are set up as family affairs with membership limited to immediate members of the family. If you had the choice, would you rather shop at a boutique or a chain store? You know what you get at a chain store: pre-packaged products on shelves that meet most of your needs but no personal service. A boutique provides you with a lot more product selection, a high level of personal service and saves you time in meeting your needs. The reason that so many people go to chain stores for groceries, hardware and clothing is that they usually offer lower prices. The interesting thing about the financial services industry is that the “chain stores” (the industry calls them “wirehouses”) like Merrill Lynch, UBS, Wells Fargo are not cheaper than financial boutiques. These boutiques go by other names such as “Registered Investment Advisors” (RIAs) or “Independent Wealth Managers.” But they are all focused on satisfying their customers, not on the sale. They are true servants to their customers. While wirehouses give the impression of size, the are limited to selling the products they have on their shelves. They can’t suggest you shop down the street for a product that’s better for you. RIAs are fiduciaries, meaning they put their clients’ interests ahead of their own. They focus on what’s best for the customer rather than the sale. According to a survey by Cerulli Associates, over half of the ultra-high-net-worth clients still have their assets at wirehouses or bank trust departments. That is changing as younger investors or the heirs of the older investors seek the kind of personal service that RIAs and Independent Wealth Managers provide. If you’re looking for boutique service without paying more for it, contact us. Have you ever glanced at the pictures of the rich and famous having a party on the deck of a Super-Yacht somewhere in the Caribbean or Mediterranean? Have you wondered what would it cost to party like that? Well, it is expensive, but not impossible. You see, they probably don’t own the yachts, they rent them. In the April 15th issue of Private Wealth, they discuss what it takes. Of course that puts it out of the price range of all except the ultra-high-net-worth individuals; those with a minimum worth of $30 million. But the number of ultra-high-net worth people keeps growing and they often decide to rent a yacht or lease a jet rather than buying one. It’s a business that keeps growing. And for people who are climbing the financial ladder (or win the lottery), it doesn’t hurt to dream big. Just How Rich Is Donald Trump? There is a problem with trying to figure out what a billionaire is worth. A lot of their assets are in things that are impossible to measure with precision. The average individual can add up their bank accounts and investment accounts. But once it gets beyond those numbers the exact value of “things” like homes gets murky. For example, your home may have an assessed value, for tax purposes, of $500,000. But the amount you can actually sell it for can range widely, often more than 10% of the assessor’s number. So this typical homeowner can’t be sure of his net worth within $100,000. So if the average American homeowner can’t determine exactly how much he’s worth, it’s a lot harder for a billionaire. For example, some very wealthy people own sports teams and these are assets that are not publicly traded so their actual value is impossible to define as Donald Sterling found out when he was banned from the NBA. The team was estimated to be $324 million but sold for $2 billion. Donald Trump’s net worth includes lots of real estate, leaseholds and assets like the value of his brand name. That means that the question of “how rich is Donald Trump” is a guesstimate not even Trump can be sure of. But you can be sure that a man with his own Boeing 757 is rich. 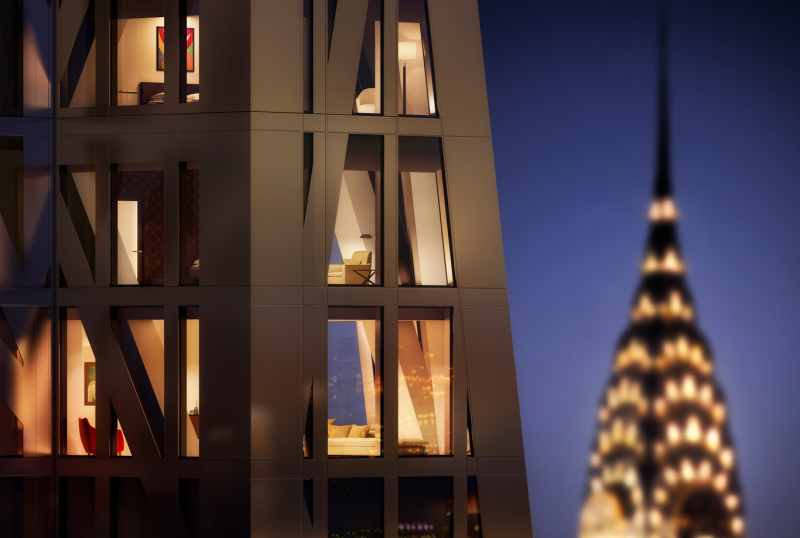 “Private Wealth” reports that the newest condo for multimillionaires and billionaires – 53W53 – is almost ready to open its doors. Located next to the Museum of Modern Art in Manhattan, prices start at $3 million but if you want a 6,643-square-foot duplex you’ll have to come up with more than $70 million. For the engineers among us, the small condos go for about $2000 per square foot, the duplex for about $10,000 per square foot. For that you’ll get access to a movie theater, private dining room and a temperature controlled wine vault. Of course if you have that kind of money you will want your household staff nearby. Residents can buy studio apartments on the 14th through 16th floors for their servants. The project was stalled for years after the real estate bubble burst in 2008. But the interval since then has created a whole host of people with extraordinary amounts of cash. Billionaires don’t keep their money in cash. The part that does not go into stocks and bonds goes into real estate, art, sports teams, and “toys” like yachts and airplanes. This explains, in part, the reasons that art auctions are reaching extraordinary heights and the very wealthy are buying properties which they may not ever live in. The people buying these properties come from all corners of the world. In many cases, they are seeking diversification, not just in the kind of assets they own, but also as a refuge in case they need to flee their home countries. For some, a place in Manhattan may be just the ticket.